Use smell to repel animals. Repel dogs, cats, skunks, rabbits, woodchucks, deer and more! Odors offend and repel animals, keeping your garden pest-free! The GARDEN SCENT-RY concept grows from the belief that animals are an essential part of our environment. Humans enjoy watching these creatures. Having them on our property is a sign of good environmental health. This product is ideal for those who believe in peaceful co-existence and do not advocate the use of poisons, traps - or any other inhumane approaches to animal control. Repellents can be used to condition the behavior of animals. Establishing and maintaining an aromatic repellent barrier will sufficiently protect your territory from many animal pests. Once you have identified an effective repellent odor and established its presence in an area, animals will find other places to feed. In some instances during the growing season, animals may "hold their nose' and brave the repellent odor because the crop is so irresistible or other food sources are not available. But even in these cases, the amount of damage to crops and plants can be controlled - no animal can hold its nose forever! The GARDEN SCENT-ry concept is control - not elimination. You add the repellent, we have the mechanism to deliver an effective repellent system. 1. Select your own repellent from a wide range of commonly available household chemicals & discarded items (ammonia, bleach, mothballs, liquid/deodorant soap, human & pet hair, etc.). 2. Fill the reservoir - the more you put in, the larger the area of coverage. 3. Add the screen and cover. 4. Put it in the ground, on a deck or pato, or suspect it from a branch or beam. Easy to assemble, easy to fill, easy to empty and easy to clean. Protect your garden with an aromatic barrier which is more effective than fencing or repellents that need to be applied after every rain or watering. This device safely holds small quantities of repellents and distributes the aroma just where it is needed without offending the gardener or environment. Made from a special type of plastic, it will last for years and will not absorb the aroma of the repellent. The concept is simple and the results are fantastic. This is a unique device for pest control which is based on well established science for pest management. Developed by two university professors, it is highly effective and environmentally friendly. Animal behavior is shaped by smell. When animals know that an area has food, and the area is safe from predators, they mark it and feed. This is why people use coyote urine to repel rabbits. A Peaceful Solution. This means that the animals are not injured. So, you can watch the rabbits on your lawn, but teach them to leave your plants alone. The neighbor's dog may run free, but he can be taught, by smell, to stay off your property. The woodchucks will leave your vegetable plants untouched. The skunks, raccoons, possums, and muskrat are repelled from the areas you protect. Protects soil, ground water and crops from chemical contamination. Many common household products have strong odors. But these products can contaminate the soils, pollute ground-water and have to be reapplied after they get wet from rain or irrigation. Ammonia or moth balls, placed in the GARDEN SCENT-ry give off odors that last a long time. The instructions include a list of repellents. Place one GARDEN SCENT-ry at each corner of a small vegetable garden. Hang one to protect a small tree or single shrub. 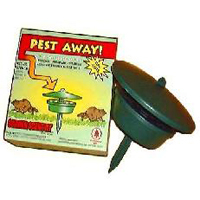 Put four in a row, about two feet apart, to keep pests from entering the property. Stake every six to eight feet when planting seeds or rows of small plants. Place one on your front step or back porch to repel stray cats and dogs. Stake, place or hang next to your trash and garbage containers. Bring on your camping trip to establish an aromatic barrier around your campsite. The GARDEN SCENT-ry has other uses. Use it as a slug trap. Just depress it in the garden soil and fill with beer. Use it to attract beneficial insects to the garden by filling it with commercially available pheromone lures. And once the beneficial insects establish a presence, you can carefully pick-up and move the GARDEN SCENT-ry taking the beneficial insects to another location. Made in the USA with recycled plastics. The parts are interchangeable and will last for years - the plastic will withstand heat and cold. You can use commercially available repellents. These chemicals will not harm the plastic and will last much longer. NOTE: Assemble prior to filling. Use necessary force. The specially formulated plastic will not break. Turn upside down to see how the center post locks into position. The parts will fit together more easily the second time they are put together. 1. 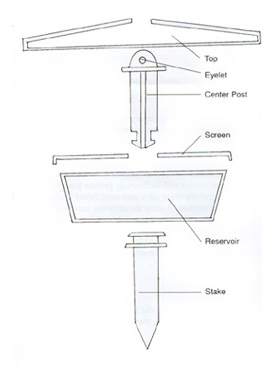 Attach top to center post. Firmly push together until permanently in place. 2. Pour (about 1 cup) or place repellents (lures or bait) directly into the reservoir. Do not overfill. When using liquids, we suggest you put a piece of paper towel, a rag, or sponge material in the reservoir prior to filling. This will help to prolong the effectiveness of many repellents. 3. Cover the reservoir with the screen. Insert post through screen and into reservoir. Press down firmly and turn until snapped into holding position. 4. The stake is optional. It can be easily inserted or removed. 5. The eyelet on top is used for hanging with a strong cord or wire. Be careful not to spill the Stake repellents. Strong winds may cause the unit to swing and this movement could spill the repellents. Take care to ensure that if the repellent is spilled that it will not injure humans, pets, or other living things. 6.To refill, unlock post and remove screen. 1. Establish your aromatic barrier early in the growing season. Condition the animals to stay out of your garden. If you don't, they may put your favorite plants on their daily menu. 2. If your plants are especially attractive to animals, and these pests are not easily persuaded to find other food, you may need to post more than one GARDEN SCENT-ry even in small areas. We once had to use two GARDEN SCENT-rys to protect 6 daisy plants from a very eager rabbit. 3. Find the route taken by the animal- Place the GARDEN SCENT-ry on the path between the animal's home and the plantings you wish to protect. We successfully used one strategically placed GARDEN SCENT-ry to protect a 16'x 16'vegetable garden from a family of woodchucks. Overall Height: Top to Bottom: 9"
Overall Width: Side to Side: 9"
Overall Depth: Front to Back: 9"
Contents of Box: Two units; including cover, central post (with hanging eyelet), base container, screen and removable stake. Repellent not included.